Carrying W.E.B. Du Bois from his birth in Massachusetts in 1868 to his death in Ghana in 1963, this concise encyclopedia covers all of the highlights of his life--his studying at Fisk, Harvard, and Berlin, his tiff with Booker T. Washington, his role with the NAACP and Pan-Africanism, his writings, his globe trotting, and his exile in Ghana. With contributions by leading scholars and a foreword by… David Levering Lewis, the book provides a complete overview of Du Bois's life. 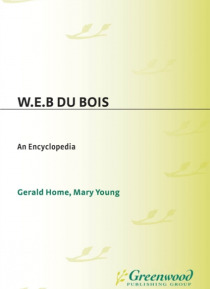 Featuring the highlights of his life, the events and personalities that influenced him, his intellectual contributions, and his activism, this book provides a complete understanding of this highly influential intellectual activist.With the conclusion of the Cold War, there is the opportunity to obtain a fuller, more complete understanding of Du Bois' entire life. Providing full coverage of his latter crucial years--often ignored in earlier works--this book provides the latest scholarly insights, including a major entry by prizewinning scholar Brenda Gayle Plummer.